ATLANTA — Arkansas senior offensive lineman Hjalte Froholdt was among 10 student-athletes that SEC commissioner Greg Sankey singled out by name in his SEC media day monologue when discussing the unique journeys and achievements of this week’s conference representatives. “Arkansas’ Hjalte Froholdt, who is from Svendborg, Denmark, marking the first time as SEC commissioner’s remarks have ever included ‘Svendborg, Denmark’ in them,” Sankey joked Monday. Froholdt wasn’t in attendance for Sankey’s speech, but he met the commissioner for the first time Tuesday as Arkansas took its turn in the spotlight at the College Football Hall of Fame in Atlanta. “We talked about (his speech). He got my name pronunciation perfectly,” said an impressed Froholdt (name pronounced ‘Yell-duh Fro-holt’). Froholdt’s journey from Svendborg, Denmark to Fayetteville, Arkansas is truly remarkable. The defensive tackle-turned-offensive guard moved to America as an exchange student prior to his sophomore year of high school. That’s when he started playing football for the first time in Ohio. It didn’t take long for the 6-5, 315-pound lineman to get the hang of it. After a brief return to his native country, Froholdt then played at IMG Academy, in Florida, coached by former Florida State Heisman-winning quarterback Chris Weinke. 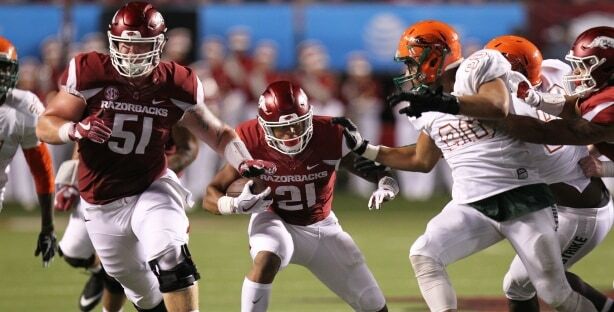 He established himself as a top college prospect and chose SEC school Arkansas over other college football powers like Alabama, Ohio State, Notre Dame and Michigan. Now accustomed to SEC play, Froholdt has developed into a model of consistency for the Razorbacks. Last season, he started all 12 games at left guard and allowed zero sacks on 389 snaps in pass protection. But when he first made the 4,000-mile trek from Denmark to Ohio, he hardly knew anything about American college football. His first taste of college football in America came at one of the grandest stages in the nation. Froholdt described attending a Penn State vs. Ohio State white out game at Beaver Stadium, surrounded by more than 100,000 spectators. “It was pretty scary, but it was awesome,” Froholdt said. Froholdt said that nothing in Denmark quite compares to college football in America. He noted that Denmark soccer undoubtedly has intense fans but not the same massive capacity stadiums. Froholdt (51) allowed zero sacks last season at left guard. Froholdt said his family and friends are able to watch most of his games thanks to ESPN’s international availablility. He added that he returns to Denmark about twice a year and predominantly keeps in touch with close friends through social media — mostly through Snapchat. Froholdt can speak Danish and English — he used to speak some German, but it “fell away” over time with little practice. He learned English around second grade, with the help of his mother, Lisa, who is from New Zealand. Froholdt said he hasn’t given much thought to whether he’ll return to Denmark once he stops playing football. For now, his ultimate goal is to continue his career in the NFL. Froholdt is a preseason candidate for the 2018 Outland Trophy — given to the nation’s top interior lineman — and was named one of the top 150 players to watch this season by NFL.com draft analyst Chad Reuter. An excercise science major, he added that if the NFL route doesn’t work out, he sees himself becoming a graduate assistant to help others train and stay healthy. In the meantime, Froholdt and the Razorbacks are focused on bouncing back from a 4-8 (1-7 SEC) season last year that resulted in the firing of head coach Bret Bielema. Under new coach Chad Morris, Froholdt is hopeful the Razorbacks can restore excitement back in Arkansas football.